Upon completing 300 hard clue scrolls, you're rewarded the uri transform emote - which personally is my favorite in game (excluding cape emotes). 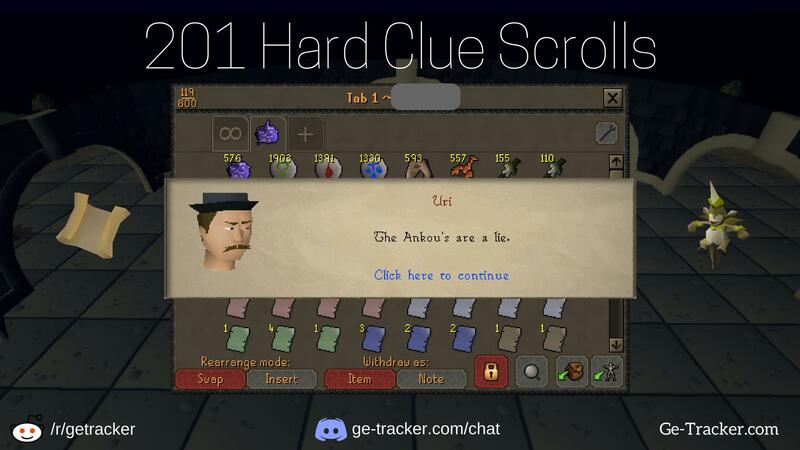 Prior to streaming the hard clue scrolls, I had already completed 99 by doing normal tasks in game, hence "201 hard clues". In order to reach the 300 milestone in the quickest fashion possible, I had to invest in magpie implings and I felt it would be interesting to keep tabs on just how much I might lose/profit overtime. In the end, I thoroughly enjoyed this clue scroll challenge :) and I was surprised with the end result.